The Roppongi Hills café/SPACE was recently invaded by Eevee, as nine top Japanese artists shared their interpretations of the cute evolution Pokémon. 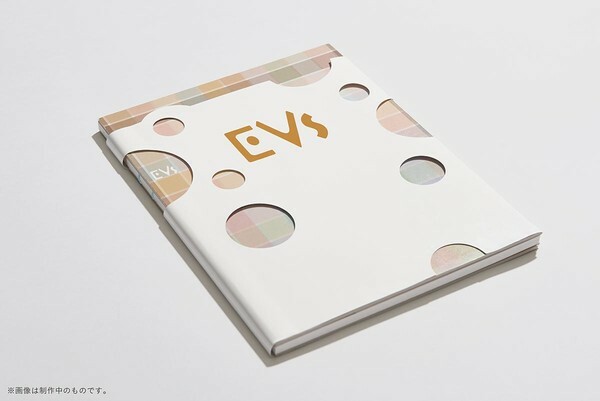 The Pokémon Company has compiled the artworks into a book sold at the gallery, called EVs. Along with commentaries from the artists and a list of all the Eeveelution Pokédex entries, the book includes a special cross-talk with the three original Pokémon character designers: Ken Sugimori , Motofumi Fujiwara , and Atsuko Nishida . The three designers reflected on the early history of Eevee’s design and how it evolved over the years. 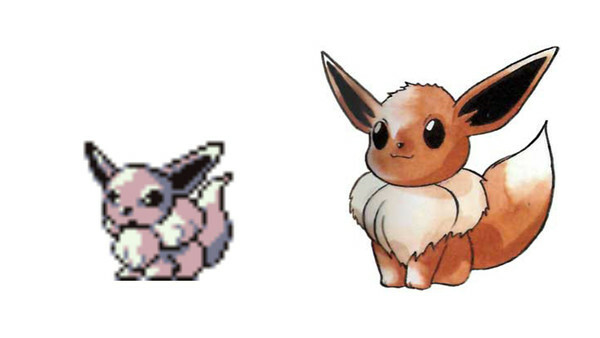 Motofumi Fujiwara drew the original Eevee sprites from the first generation Pokémon games. He mentioned that Satoshi Tajiri , the creator of Pokémon and director of the original games, requested that he design a Pokémon with the potential to evolve into various different elemental types. Fujiwara envisioned a plain Pokémon that did not look like any distinct animal. “I wanted to create a blank slate Pokémon,” he said. This early design had all the main characteristics of the modern Eevee: long ears, a fluffy tail, and a white ruff around its neck. Fujiwara said that it reminded him of a fluffy cat or dog-like creature one would see in the country. “Once, when I got lost in the forest as a child, I encountered an indefinable creature.” He drew upon his vague childhood memories to create Eevee. The designs for the evolutions came after; Fujiwara drew Jolteon and Flareon, while Atsuko Nishida (who is best known for designing Pikachu) drew Vaporeon and the other evolutions in later games. Ken Sugimori commented on his early illustrations of the Pokémon, 20 of which were displayed at the exhibit itself. The pixel art sprites from the Green, Red, and Blue games came first, and he based his illustrations off those. The other designers, in turn, took inspiration from his illustrations when designing the Pokémon in later game entries, especially when it came to the colors and shading. The designs of the Eeveelutions changed as the technological limitations they were working with lifted. The designers first decided the colors for the Pokémon when making all the Game Boy games compatible with the Super Game Boy. Most of the Pokémon’s colors were determined according to their type, but because Eevee was the “blank slate” Pokémon it was given the most naturalistic colors. From around the creation of Ruby and Sapphire, the designers started drawing the concept illustrations before the game sprites instead of the other way around. This led to a fundamental change in the way the designers envisioned the Pokémon and drew them. However, it also introduced problems for Eevee when X and Y introduced 3D models for all the Pokémon. 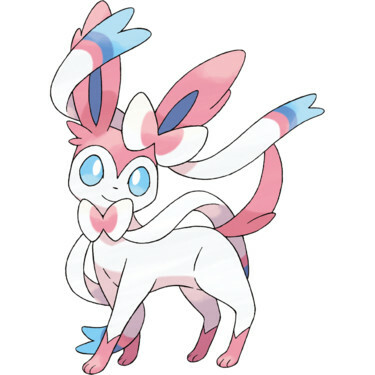 As a first generation Pokémon, its body shape and aesthetic looked drastically different from Sylveon, a sixth generation Pokémon. “Each Pokémon was influenced by the setting of the game it came from, but Sylveon was completely new. I really wanted to emphasize its fairy characteristics,” Nishida said. In light of Sylveon’s addition, the designs of the rest of the Eevee family were adjusted. Eevee’s simplicity and plainness, however, still remains even in the modern design. The Pokédex also entries influenced the designs and vice versa. For example, Sugimori asked Nishida what the ribbon on Sylveon signified, and he liked her explanation so much that he added it to the Dex entry. The designers speculate that it is perhaps because one can imagine Eevee existing anywhere that the Pokémon has fans across the entire world. As the evolution Pokémon, Eevee represents endless potential – that is its most unique trait.